Throughout the centuries there have been many opponents of Christian theology, both religious and irreligious. They vary widely in the details of their beliefs, but they all seem to hold one common idea: Intellect and religion are antithetical. This book is addressed to these opponents of Christian theology. The irreligious, the atheists, believe that the mind belongs to science, which, they say, is the most reliable method, if not the only way, of discovering truth. Atheists are content to allow religious folks their foibles, but only so long as they do not claim that their beliefs are true. Truth and theology, according to the atheists, have nothing in common. Religious opponents of Christian theology, Modernists and the Neo-orthodox, agree with the atheists that the intellect and religion have nothing to do with each other. True religion, they say, consists of states of consciousness, of feelings of awe, mystery, absolute dependence, and a sense of the numinous. These religious opponents of Christian theology teach that truth is personal, not propositional, let alone Biblical. Personal encounter, not understanding and believing revealed information, is the heart of religion. A third group to whom this book is addressed is churchgoers who have been influenced by both the atheists and the Neo-orthodox, and thus simply ignore Christian theology. They are not actively opposed to theology as the atheists and Neo-orthodox are, but they regard it as unimportant. 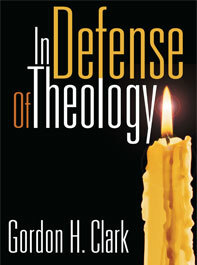 To all these people Dr. Gordon Clark offers an intelligent and irrefutable defense of Christian theology. God has revealed himself in words arranged in logical sentences. We are obligated to understand and believe those words. There is no other way to know truth and obtain life.